I baked this in a 8-inch tart pan with excess dough and custard, so it will probably fit nicely in a 9-inch pan. Make sweet tart pastry. Brush tart with egg yolk after ~10-15mins of baking and continue baking for 5mins. Leave to cool. Break eggs into bowl. Add orange and lime zest. Add sugar and mix well. Cut and puree mango. Sieve puree to remove fibers. Add puree to the egg mixture. Set bowl over a pan of gently simmering water. Stir constantly until mixture coats the back of a wooden spoon. The mixture should still be liquid enough to be pourable. Pour mixture into tart shell. Baked for 50-55 minutes until custard has set. Leave to cool and decorate with sliced mangoes. Note: I’ve found that letting excess pastry drape over the tart tin and then cutting it off after baking is a good way to ensure that the tart shell has enough and even height. Adapted and inspired by Luis’ The Tropical Manchester Tart in The Great British Bake Off Big Book of Baking. Lower the heat to 180C. Keep an eye on them. Once you see the custard being puffed up a bit, pull the oven door open about 2 to 3 inches. Bake for another 10 to 15 minutes or longer until the custard is cooked through. 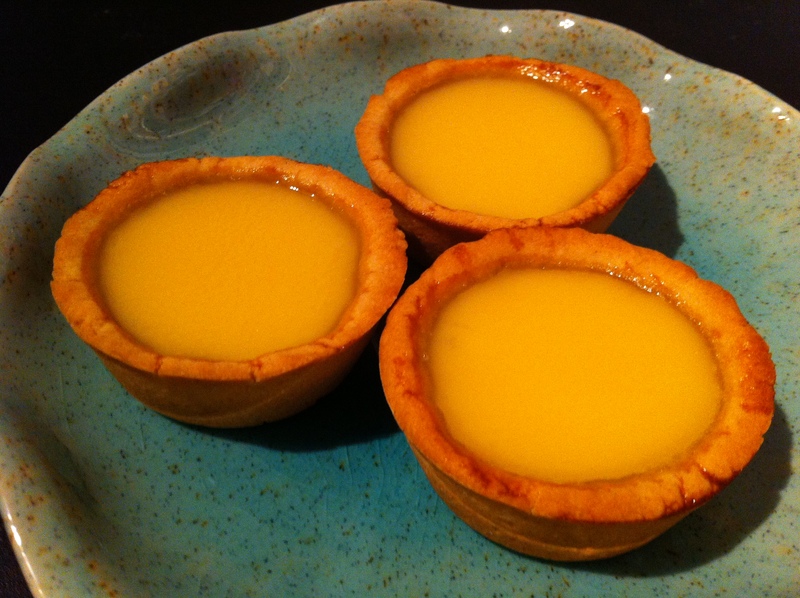 Just insert a toothpick into the custard to taste for doneness. Check also that the bottom of the crust is hard and cooked. This recipe gives slightly more custard (~1.5 tarts more) than required for 12 egg tarts baked in a 12-hole muffin tray. I will try reducing the amount of custard next time.